July 9 is Sugar Cookie Day. Are you a cookie baker? 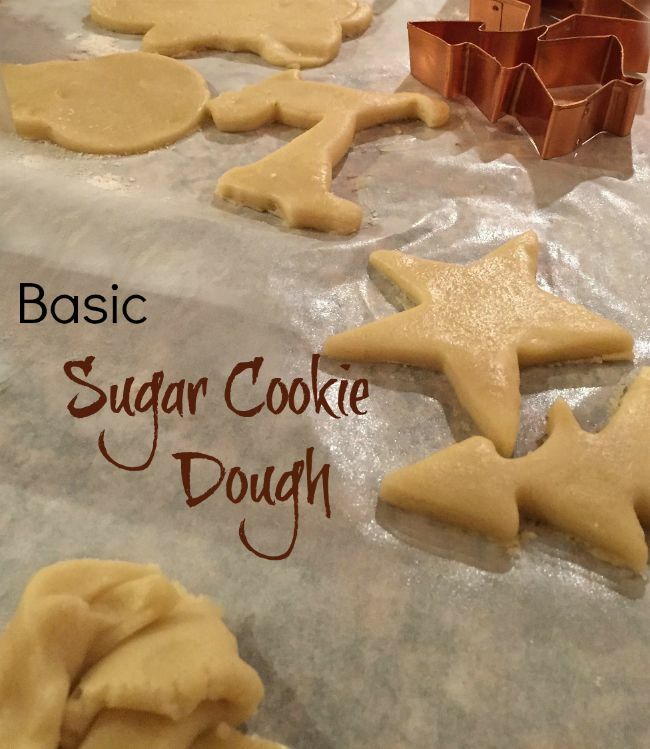 It’s easy to resort to slice and bake cookies but it is also super easy to make your own basic sugar cookie dough. It keeps well and can be used to make all sorts of delicious holiday treats. Why Buy Slice and Bake? Make Your Own Basic Sugar Cookie Dough in Minutes. Start by whisking together your dry ingredients in a large bowl. Whisking incorporates the dry goods, and breaks up clumps. It also adds volume to the flour. You can also sift, but whisking is faster and I always use this method for breads and cookies (for cakes, where lightness is needed, I sift). Anything that gets me out of the kitchen more quickly is a great idea as far as I am concerned. I love to cook, but I love other things too. Alas…life is just too short! Next get out a stand mixer and mix the eggs and sugar and butter. 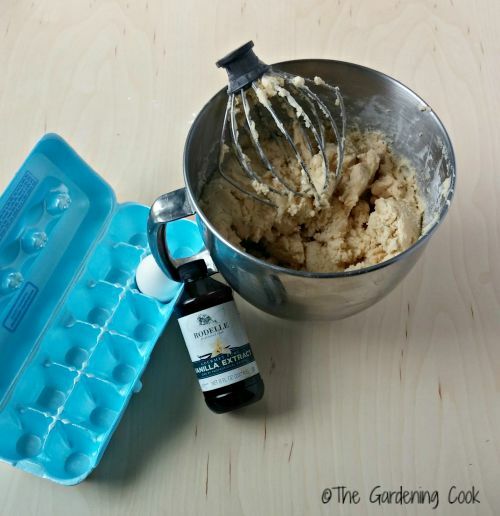 Be sure to use a good quality pure vanilla extract. It makes all the difference. You can use a hand mixer, but this recipe calls for a big batch with five cups of flour, and even a stand mixer complains about the amount. (You’ll see why later…) Combine well, adding the dry ingredients a bit at a time. And use the flour protector. I promise you – you will be glad you used it! If you don’t you will end up not needing any special props to have artificial snow on your kitchen counters for the holidays. Now comes the easy part. Scoop it all out, and wrap it in saran wrap and stick it in the fridge for an hour, or a few, or overnight. What ever floats your boat. Just get it in there. All that butter wants to sort of harden up again. Skip this step, and you won’t like the way the cookies turn out. Guaranteed! That’s one big hunk of goodness right there. Once it has been in the fridge for a while, you are ready to start baking. But I doubt anyone will need a recipe with five cups of flour, two cups of sugar, and four eggs. Unless you have a big family. Or you just decide to eat 48 cookies all at once, for some unknown reason. Or when someone breaks your hear, and you just want to be Cookie Monster for a while. So divide it up! Just roll the dough into logs, and place in Saran wrap. Place it in zip lock freezer bags, roll again and stick those babies in the freezer. Think how relieved you will be the next time your child comes home, and tells you that they need cookies “TOMORROW, MOM! 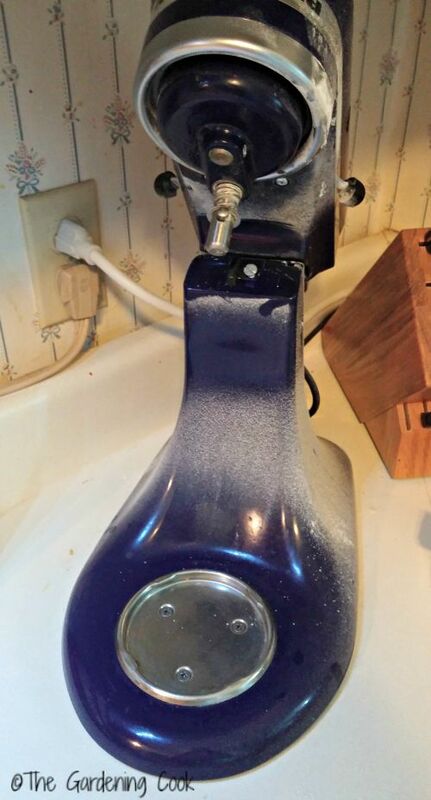 !” Remember when I said I would tell you why a hand mixer is not a good idea for this recipe? Check it out! Even my Kitchen Maid stand mixer complained about all that flour! And that was with a flour sleeve to keep it in the mixing bowl. Yikes! I can’t imagine what my kitchen would look like if I used a hand mixer for this one. I’m not a tidy baker by any means, but man alive! 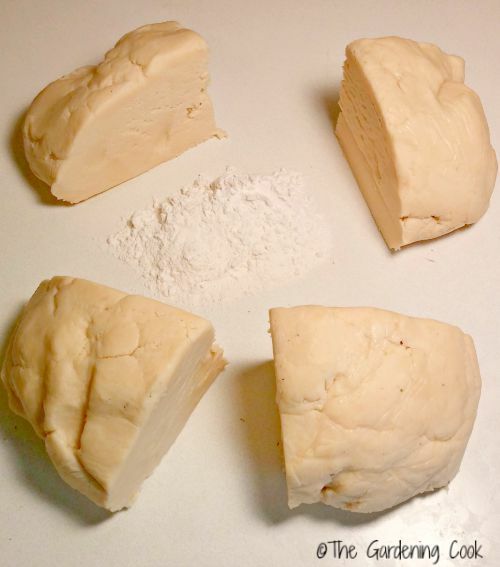 All that is left to do now is to roll the dough on a floured surface, 1/4 to 1/2 inch think, cut with your favorite cookie cutters and bake for 6-8 minutes depending on how crispy you like them. I recently got some discontinued 101 Wilton Cookie Cutters for a bargain price on Amazon. Look for me baking up a cookie storm for the next few months! 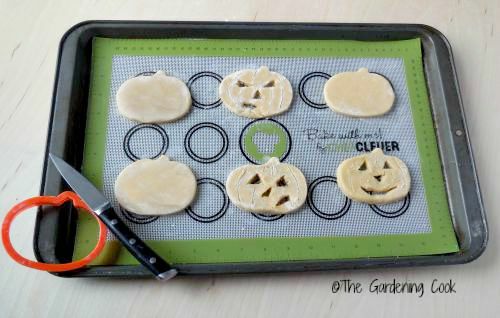 Check out my new Halloween Pumpkin double layer cookie recipe, plus a chance to win one of five silicone mats from Chef Clever. Do you bake more this time of the year? Let us know in the comments below what your favorite holiday is! Whichever you like, this basic cookie dough recipe will have you baking up a storm too. 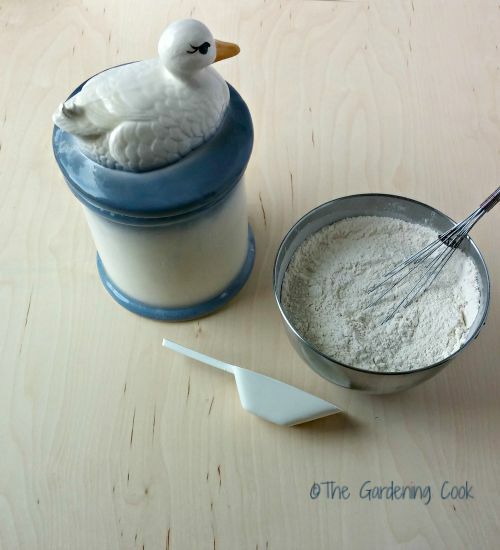 Whisk together the flour, baking soda and salt in a large bowl and set aside. In the bowl of a stand mixer, cream together the butter and sugar. Mix in the eggs, one at a time and add the vanilla extract. Mix well until a stiff dough forms. 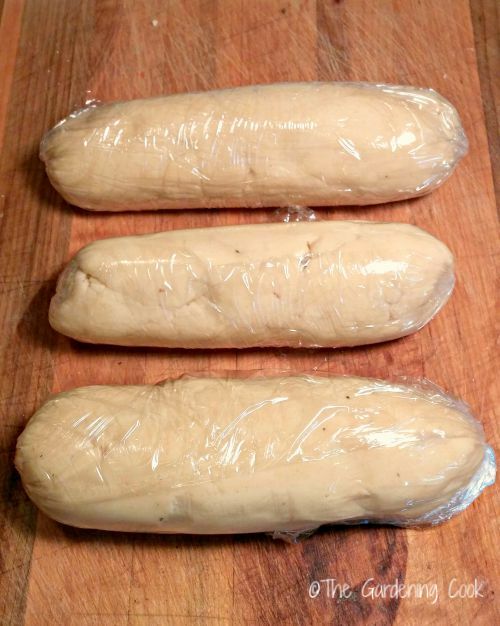 Place the dough on a sheet of saran wrap and place in the fridge for at least an hour or overnight. Take out, and divide into even sized portions if you won't be using the dough all at once. Roll into logs, wrap in saran wrap and zip block baggies and freeze what you don't need. 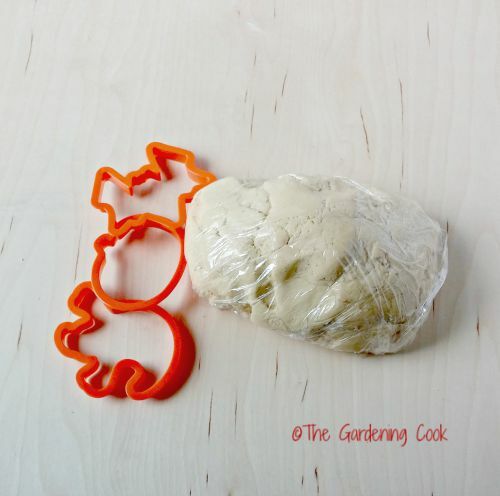 Roll the dough out on a flour board, ¼ - ½ inch and cut with cookie cutters.